Radial keratotomy is a type of eye surgery that is used to correct permanently myopia (pronounced my-O-pee-ah) or nearsightedness. In this surgery, a physician typically cuts slits into the cornea (pronounced KOR-nee-ah) with a tiny diamond scalpel, changing the shape of the cornea. The diamond scalpel is rapidly being replaced by laser surgery, which is quicker, more reliable, and has fewer complications. The human eye can be considered a kind of extension of the brain. As an image-gathering tool, it can also be thought of as a camera, with the brain doing the developing of the picture. In many ways, a camera is similar to an eye in that both have a lens that can be focused for different distances. The retina (pronounced REH-tih-nuh), the innermost layer of the eye, can also be thought of as the film in the camera. If looked at sideways, the human eyeball is spherical or round and has a bulge in the middle of its front. This outermost bulge or bump in its center is called the cornea. Described as a transparent (meaning light passes through) guard of the eye, the cornea is the first thing that receives the light that bounces off an image and goes into our eye. This is how human vision actually works, as our eyes detect light that is reflected from an object. The cornea is like a transparent front window that does the initial focusing for the eye. Although it is not nourished by blood, it is kept moist by a fluid called aqueous humor (pronounced AY-kwee-us HEW-mohr). The shape of the cornea is very important since it slows the light entering the eye and bends it toward the center of the eye where it meets the lens. Most of the focusing is done by the cornea, with the lens doing some fine tuning of the image. In general, the more curved the cornea is, the more it focuses. Myopia or nearsightedness (meaning that a person can see things better that are near than those that are far) is caused by eyeballs that are too "long" or too steeply curved. When this happens, the light rays are focused before they ever reach the retina, so that the image is out of focus or blurred by the time it does reach it. Aqueous humor: Clear liquid filling the small cavities between the cornea and the iris and between the iris and the lens of the eye. Cornea: The outer, transparent part of the eye through which light passes to the retina. Nearsightedness: Vision disorder caused by an eyeball that is too long or a lens that is too strong; objects up close are seen easily while those far away appear blurry. Retina: The light-sensitive part of the eyeball that receives images and transmits visual impulses through the optic nerve to the brain. The eye surgery called radial keratotomy is a procedure that changes the shape of the cornea (and therefore how it bends light) in order to correct its focusing errors. 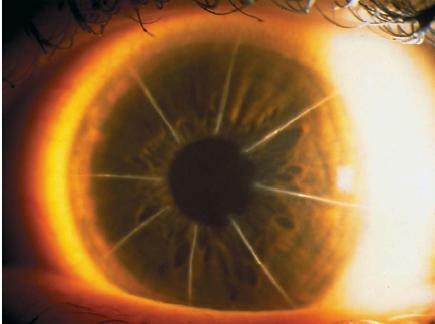 The surgery achieves this through microscopic radial cuts made in the cornea. The word "radial" describes the pattern of slits that "radiate" out from the center of the cornea like the spokes of a wheel. The word "keratotomy" is a compound Latin word in which "kera" means cornea and the suffix "totomy" means to cut. As long ago as 1869, a Dutch ophthalmologist (pronounced aaf-thaal-MA-low-jist) or eye doctor suggested that if the cornea could somehow be flattened by surgery, it might improve certain people's vision. He conducted a series of experiments on rabbits some years later. Although others in Norway, America, Italy, and Holland performed similar experiments around the beginning of the twentieth century, it was in Japan in the 1930s that a physician named Tsutomo Sato performed about 200 operations on people with mixed results. Modern radial keratotomy was pioneered by Russian ophthalmologist Svyatoslav N. Fyodorov in the early 1970s. There are two different stories as to how Fyodorov came to use radial keratotomy successfully. One story tells of a boy whose eyeglasses shattered and left tiny fragments of glass embedded in his cornea. Another story tells of a pilot with similar accidental cuts in his cornea. In either (or both) cases, Fyodorov noticed that when the cuts had healed, the patient's previously poor vision had improved because the cornea had been "flattened" by the accidental cuts. Fyodorov soon began to perform cornea surgeries regularly by 1974, and by the late 1970s, his new technique had become known around the world. In 1978, Leo Bores became the first to perform a radial keratotomy in the United States and soon after began training others. Radial keratotomy was found to improve nearsightedness because it flattened the central part of the cornea by making cuts in its sides. The length, depth, and number of cuts was usually different in each case, depending on the patient's condition, age, and the curve of the cornea. This flattening of the cornea brought the focal point of the eye closer to the retina and improved distance vision. The surgery was performed using a highly precise diamond-tipped or sapphire-tipped scalpel (blade) that is set to a particular depth. This surgery is usually quick, generally painless, and its recovery period short. However, it sometimes resulted in irregular healing or infection. Others have experienced what is called "variable vision" in the course of a day, and sometimes scarring would result in blurred vision. Although radial keratotomy is still performed and even recommended for certain cases, most eye doctors now recommend it be replaced by laser surgery. Laser vision correction, now known as LASIK surgery (for LASer In situ Keratmileusis), is the newest and usually best form of radial keratotomy. Instead of using a knife to makes slits in the cornea, the surgeon reshapes the cornea using a process called "photoablation" (pronounced foe-toe-ab-LAY-shun). This process uses an intense beam of ultraviolet laser light that is precisely controlled. With it, the surgeon stimulates the molecules in the cornea to the point where certain ones break apart and vaporize. The tissue that is disappearing is actually no more than one five hundredth the thickness of a human hair. What is remarkable about this procedure is that the tissue around and even underneath is not at all affected. Doctors use a computer to perform laser vision correction surgery and program its software according to a number of variables since each patient is different. Today's laser vision correction has become quicker, cheaper, and safer than ever. Modern LASIK has rapidly become the procedure of choice for most surgeons who recommend it because it produces better results with less discomfort in a quicker period of time. Overall, the older, scalpel-based radial keratotomy has increasingly been replaced by the newer laser-based surgery. Radial keratotomy was an important step in the evolution of vision correction surgery.